Well, that was fun. Much better than I expected from a Jane Austen fanfic. I’m not a fan of the many what if’s written about Mr and Mrs Darcy, but add a little magic—er, glamour—into the mix and I’ll read it. Disclaimer: No, actually I won’t. I think Kowal filled my quota. Misses Jane and Melody Ellsworth are like Elinor and Marianne Dashwood with a little Anne Elliot thrown into the mix. Mr Ellsworth is Mr Bennet with a little more sense and Mrs Ellsworth is Mrs Bennet with a little less sensibility. The hero is Mr Darcy with something extra and Ms Dunkirk is a mix of Georgiana Darcy and a Harriet Smith. There might have been hints of Mansfield Park and Northanger Abbey too (there definitely were) but as those aren’t my favourites I can’t be relied upon to recognise those references. …and if you know your Jane Austen, I’ve just told you the plot of the book. What remains wholly original to Kowal, as far as I can tell, is glamour. It’s the sort of magic that has become an art young, distinguished ladies practice like they would practice music or embroidery. Glamour is about manipulating ether to create fixed illusions or coaxing berries to ripen a little faster. It’s very tiring and can cause an over-eager glamourist to swoon. The only way to get better at it is to become smarter. Towards the end Jane and her intended did start to become their own characters to me, but it was like talking to a person and recognising their parents’ distinct features on their face: That might not be Lizzie’s nose but the ears are Anne’s. 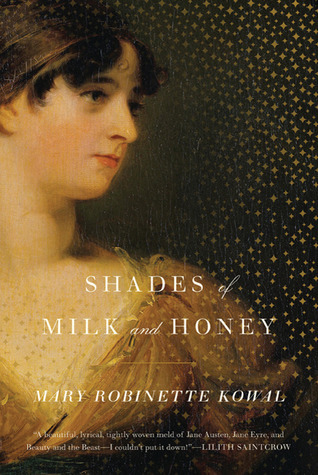 This entry was posted in book review, fantasy, historical, read in 2014, romance and tagged Glamourist Histories, Jane Austen, magic, Mary Robinette Kowal, Shades of Milk & Honey. Bookmark the permalink. You don’t like Mansfield Park? Well, I don’t like Jane Austen’s fanfic. That is not the cover of the book I read but alas, the other image didn’t work. Thanks for fixing it Ana.